Marshawn thought she was on the right path. She was an accomplished business woman and high-powered sports attorney ready to marry the man of her dreams—until she learned just days before a fairytale wedding that he was cheating on her. After betrayal flipped her seemingly perfect world upside down, she found herself craving significance, not just success. 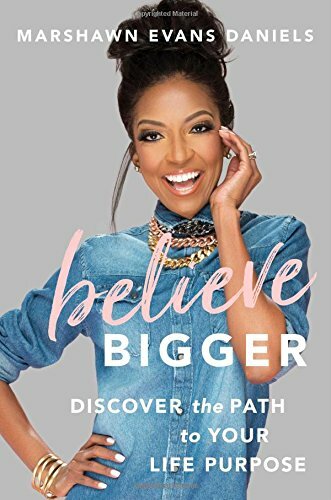 Believe Bigger is about resilience, reclaiming your life, and how God uses rejection, hardship, and unexpected circumstances to awaken something greater within...if you’re willing to embrace disruption. You'll see her go from heartbroken and hitting rock bottom financially, to building a multi-million dollar faith-centered enterprise, and finding something super sweet along the way. Calling. Marshawn shares what it takes to turn pain into purpose and your mess into a larger message and life mission. Whether you are drowning in self-doubt and regret, feeling stuck, or sensing a shift but unable to discern what’s next, Marshawn’s Purpose Map outlining the 5 Stages of Divine Reinvention, will give you insight into your true gifts and calling—and the courage to pursue them. You’ll see that difficulties are not designed to devastate you, but to ignite the bigger dreams, life, love, and abundance you were destined for all along.